With the emergence of big data has come the need for applications to collect and deliver smarter insights, faster. Splunk Enterprise is the leading software platform in delivering valuable insights from machine generated data gathered from anywhere in your infrastructure. 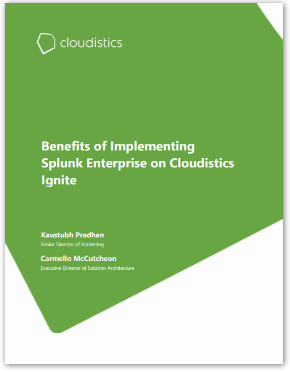 With independent third party testing results included, this whitepaper reveals how enterprises seeking to deploy Splunk will instantly realize the benefit of a full end-to-end, ready-to-run Splunk infrastructure right out of the box with Cloudistics Ignite.